This brand new manufactured home is ready to move into! This beautiful home has over 1300 sq. ft. of living space and has loads of upgrades which include granite countertops, mosaic tile backsplash, laminate flooring and stunning cabinetry. The home also comes with all new kitchen appliances. Please contact us at 209-744-0400 to schedule a private viewing or to make an offer. The home is located in the Three Palms Mobile Home Park in Galt, Ca. Asking price is $142,500. Manufactured homes are seeing a resurgence in popularity. You may know them as mobile or prefab homes, but the manufactured homes of today are much more varied, modern, and up-to-date than the ones you might remember from decades past. With the advent of the tiny house movement and consumer desire for environmentally sound products, it’s no wonder that manufactured home sales are on the rise. There are several types of manufactured homes for sale, and nearly as many styles and configurations as there are consumers who want to buy them. From single family manufactured homes to prefab multi-story modular Cape Cod style houses, the possibilities for factory built or prefab homes are many. Let’s start with the actual types of manufactured(mobile) homes before we talk about layouts and style options. There are three main types of manufactured homes. Modular or manufactured homes, also referred to as mobile homes, are made up of two or three section modules, which are then transported to and assembled on site. Each module comes outfitted with the requisite doors, windows, and other features necessary to the home. Plumbing, wiring, and fittings come with each module and are already in place when the home is delivered, making actual build time on site simple and quick. Panelized homes are factory-manufactured one panel at a time and assembled on site. This means that each wall is made individually, as are the roof and floors. These panels are shipped to the build site and assembled there. Panelized homes do not come with plumbing, fittings, and wiring. Panelized homes take longer to set up than modular homes, but a benefit of this home type is that you can customize it to your specifications. Precut homes were the very first iteration of prefab houses. They’re sold as kits that you can order and assemble yourself. The kits contain all of the precut parts you’ll need to assemble your home on the build site you choose. 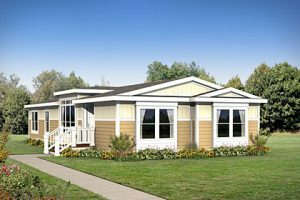 Let’s look at a few mobile home styles and floor plans to get an idea of the variety available on the market today. This 428 square foot manufactured home is a great example of a “tiny house”. Labeled a Backyard Home, this one bedroom, one bath structure could also be used as a guest house or office space for an already existing home. Also in the Backyard Home category is a slightly larger (615 square feet) home featuring a larger bedroom and eat-in kitchen. This allows for a dedicated living room space and a roomier bedroom that’s tucked away off of the kitchen and dining area. The 12 Wide Spirit is a more traditional mobile home, with a linear layout. With the long and lean style of the structure, two bedrooms are able to be included in the home’s 583 square feet of space. 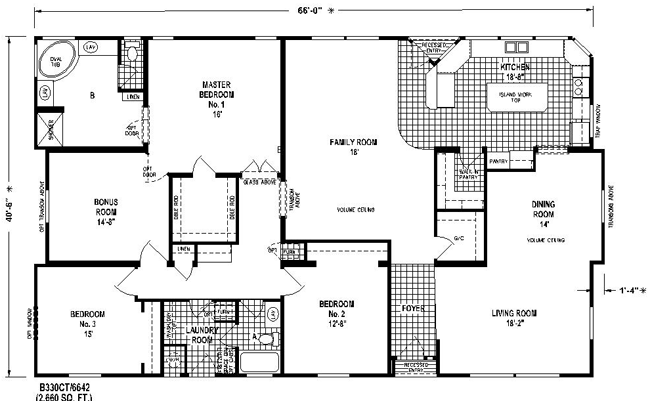 The kitchen, bathroom, and living areas are clustered in the center of the home, with one bedroom anchoring each end. 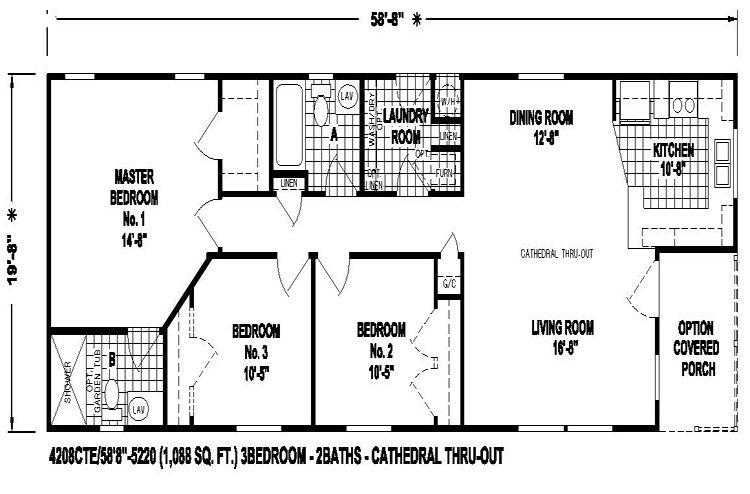 If you’re interested in a manufactured home that feels more like stick-built, the 20 Wide Brookstone, with its cathedral ceilings and multiple bathrooms might be the home for you. It has a separate dining room and kitchen, three bedrooms, and an optional covered porch. The Triple Wide home is just what it sounds like – a mobile home that is triple the width of a basic model. At 2660 square feet, it has everything you would expect a typical home to have – four bedrooms, two baths, as well as both a living room and family room. The living room is generously sized and a bonus room can serve as a playroom or office. If you’re looking to move into your new home quickly, you’re in luck – a manufactured home can be move-in ready in as few as four months from initial contact. In addition, the production of manufactured homes incurs less waste than traditionally built homes. Less fuel is used as well since all parts of the home to be assembled arrive on site at the same time. Manufactured homes pass rigorous testing at each juncture in the manufacturing process. They’re built to be shipped, which means they’re sturdy. And, since the pieces for your home are built in a factory, they will have been under climate-controlled conditions and not subject to environmental damage before they’re even shipped to the build site. If these benefits are appealing to you, give us a call at 209-744-0400 to schedule an appointment to discuss your new home possibilities. I live in a double wide matuafcnured home and as a handyman who works on matuafcnured homes and site built homes I can say that matuafcnured homes are built as well as if not better than some site built homes I have worked on. I suppose that is because of the federal regulations that apply to matuafcnured homes that don’t apply to site built homes.